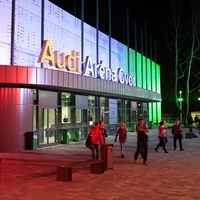 Just a bit more than a year after the foundation stone had been laid, the new Audi Arena Györ has been opened and welcomed its first spectators. The hall will host the six preliminary round matches of Group A, involving Hungary, Russia, Spain and Poland, at the Women’s EHF EURO. It is also the new home for Women’s EHF Champions League winners Györi Audi ETO KC who will play their first Champions League match in the arena already on 23 November when they meet IK Sävehof – the match is already said to be sold out with the maximum of 5,500 spectators attending. The opening was attended by Hungary’s prime minister Viktor Orban, the Györ mayor Zsolt Borkai, Managing Director for Audi Hungary Thomas Faustmann and Anita Görbicz, the team captain Women’s EHF Champions League winners Györi Audi ETO KC. "A great dream has come true today in Györ. The construction was inspired by the success, the success allowed us to build this hall," said Zsolt Borkai. "Now we can easily organise colourful cultural events, and our versatile cultural programmes and success in sport can be celebrated in a worthy environment within the walls of this multifunctional building." Anita Görbicz said: "It’s a fantastic feeling to stand here in this wonderful arena. We have all been waiting for this moment. "This hall will delight every resident of Győr and all fans of Hungarian sports and culture. We are proud that this hall can be our home from now on and we can play here. "We would like to thank the city of Györ – they are such a good home of sports, and we as a team would like to fill this beautiful Aréna with a lot of goal, victory and joy in the future."